Shiksa, n; Yiddish (a) the original name for the female version of a well-known electric razor. (b) The slang term for a maid in an upscale Jewish household. (c) A non-Jewish girl who would `do it“. (d) Any single or married Gentile woman. Renowned violinist Lara St. John is a Canadian; American; European and world-traveller who is one of the most creative people we know. Everything she does must include something unique and personal. We`ve kept every Christmas card she`s sent us! That the classical musical ecosphere respects and continually acknowledges her reflects on her talent and inspired originality. So, as objectively as possible (considering our conventional MEDIA oath of impartiality); our observations about SHIKSA. It`s not perfect because there are cuts that will not please everyone. But a ninety percent appreciation is well over average. Oddly, it is one of the Palestinian selections that touched us the most. Her rendering (arranged by piano accompanist Matt Herskowitz) of the folk song ‘Hava Nagila’ so affected us that we SKYPE™ed an Israeli friend in Amatziah (near Hebron) just to share thoughts. 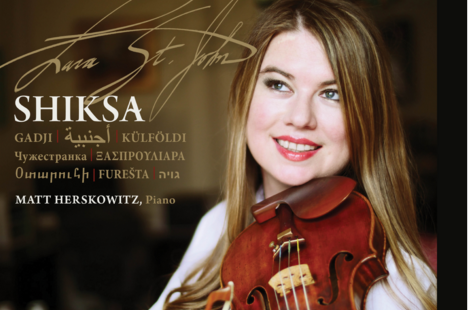 The overall impression of the CD is Klezmer and given St. John`s technical skills, she`s managed to capture the essence of that genre. It is especially effective in the Eastern European numbers.